The Northern Goshawk is the most widely distributed Accipiter in the world. A denizen of mature forested regions, the species inhabits boreal and temperate forests in North America, Europe, northwestern Africa, continental Asia, and Japan. In North America, goshawks occur in Canada, the northern United States (including much of Alaska), the mountainous western United States, and northwestern Mexico. The largest of the three North American Accipiters, Northern Goshawks are powerful raptors about the size of Red-tailed Hawks. Historically, Northern Goshawks have been prized falconry birds admired for their capacity to take large prey. 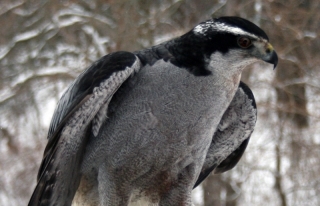 In 1929, a five-dollar bounty was placed on the goshawk by Pennsylvania Game & Fish in an effort to protect game species that were sometimes preyed upon by goshawks. The bounty greatly increased raptor shooting throughout Pennsylvania, including along the Kittatinny Ridge. Accounts of irruptions of goshawks in the late 1920s, together with raptor shooting at Hawk Mountain, attracted the attention of conservationists, and ultimately led to the founding of Hawk Mountain Sanctuary, the world’s first sanctuary for birds of prey. Goshawks and other North American Accipiters, or “bird-hawks” were among the last raptors to receive legal protection, and it was not until 1972 that all raptors were protected under the Migratory Bird Treaty Act. Adult goshawks have black crowns, white eyebrows, and red irises. As adults, Northern Goshawks are gray above and light gray with black horizontal bars and vertical streaks below. Their tails have a series of alternating dark-gray and lightgray bands. Females typically are larger, browner, and have more heavily marked underparts. Juveniles have brown heads, orange irises, and less distinct, whitish eyebrows. From above, juveniles are brown with a fair amount of white mottling. From below, their cream-colored underparts are heavily streaked with brown. The tails of juveniles have a series of wavy, alternating dark-brown and light-brown bands with thin white borders. Like other Accipiters, the goshawk’s typical flight pattern consists of a series of quick wingbeats interspersed with brief bouts of gliding. Compared to the two smaller North American Accipiters, the flight of Northern Goshawks is more direct, and the flapping is slower with deeper wingbeats. Northern Goshawks are monogamous, and pairs typically lay a single clutch of three to four eggs each year. The incubation period lasts 35 to 38 days and the female does most of the incubating. For nine to fouteen days after the eggs hatch, the female remains at the nest brooding the nestlings. Thereafter, females spend less time brooding during the day, but continue to brood at night until the nestlings are 24 days old, after which they are brooded only during periods of wet and cold weather. Young goshawks fledge when they are 36 to 42 days old, and they become independent four to eight weeks later. Males fledge earlier and become independent sooner than their female siblings. Fledglings remain dependent on their parents and continue to associate with each other while their flight feathers harden and they learn how to hunt. As they become more proficient in flight, fledglings fly toward and intercept their parents as the latter return with prey.